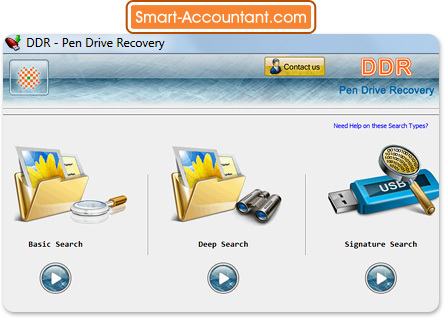 Introduction-Data Recovery Software for USB Drive is the advanced data recovery solution to recover deleted, lost or missing files/folders from formatted or corrupted removable medias including pen drive, thumb drive, memory card, compact flash media, smart media, USB drive, memory stick and many more removable devices. This data recovery process efficiently retrieves all types of Microsoft Office documents, music and digital files in its original form and facilitates to preview recovered data after the scanning of removable media. USB file restoration tool restores data even if windows displays error messages such as device not formatted or device type not found in the computer system. Pen drive data revival utility is the best data recovery program to restore previously existing data from the formatted removable device. Software utility is useful for home users, students, and other business users who have lost their crucial data accidentally and want to recover it back in its original form. Where Does USB Drive Data Recovery Software Work? Restore lost, erased or missing files and folders such as text, pictures, images, audio and video files. Undelete deleted data from reformatted or corrupted USB drive removable media. Recover formatted or invalid all type of file formats such as txt, doc, rtf, jpeg, jpg, mpg, mpeg, bmp, wma, mp3, mp4, tiff, mid, midi etc. Support all type of USB drive removable media that includes pen drive, thumb drive, USB drive, compact drive, smart drive, memory stick, zip drive etc. Support major manufacturers of removable media including Acer, BenQ, Canon, Casio, Fuji Film, HP, Jet Flash, Kingston, Panasonic, Pentax, Ricoh, Samsung, Sony, Vivitar, Yakumo etc. Revive data even if device not recognized while device is accessing in My Computer. Preview recovered data in tree structure format.